5 months: New firsts, Skills & More! I feel kinda bad for Rex – I think that Scott and I still picture him as this little tiny baby who can’t do anything and that’s definitely just not Rex anymore! He can do all kinds of stuff now! For example, Scott set him down last night on the floor and before we knew it, Rex had rolled across the room off the carpet and onto the tile (so yeah, he’s been rolling around both left and right back to front and vice versa for a while now… sadly I can’t really say when this happened, eeek!). The little dude can get around! Geez, where did the time go?! Before I get into it, here’s a video of the two littles interacting (PS. Shout out to Mike K for teaching me hyperlinks, LOL! Thank you!). I think it’s safe to say that despite the torture at the hands of Toddzilla, Rex is still Landri’s biggest fan. He smiles and giggles at her most of the time when she’s not hurting him. So Rex’s latest firsts…He had his first trip to the beach (hence the road trip blowout pics in previous post), and he pretty much screamed the entire time that we were on the actual beach. To be fair, it was HOT, it was naptime, and he had just had his 4 month shots, so I’m hoping that’s the explanation. And while in Corpus at the beach, he also went on his first trip to an aquarium! Also this month, like Landri, he attended his first professional sporting event (Astros game in Houston). On a sad note, he got his first BIG fever. He’s had a few small grade ones in the last few months, nothing serious or worthy of medicine, but one night (at midnight of course) he got a 104.3 fever and I was terrified. I called the nurse hotline and apparently 105 is the ER cutoff for his age level, so I gave him a bath, and basically didn’t sleep, watching him until morning to make sure he was comfortable and not developing a rash or starting to act unusual (serious warning signs). In the morning we went to the doctor and confirmed that Rex had his first ear infection! I hope that he’s like Landri and only has one which was sometime around this age. It was crazy though, and I remember being relieved at one point when I saw only 103.3 on the thermometer, LOL! 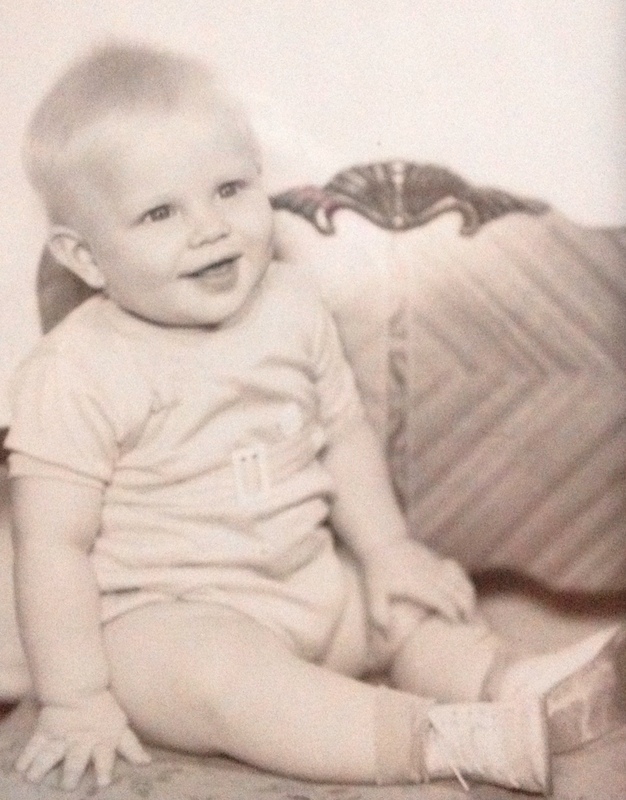 On a totally random note, I think Rex looks a lot like my dad as a baby. Here’s my dad to the left. On other fronts, little Rexie Roo Roo (yes, that’s still one of his nicknames and even Landri knows it) has several skills that he’s become quite proficient in. He now sees bottles coming and gets VERY excited. He’s still working on holding them though. He kind of can, but definitely has room for improvement because his hold isn’t very solid. He also stays awake much longer now and has even been seeping most of night – woohoo! He usually gets up super early for a bottle between 5:30 and 6:30 and then goes back to bed until 8:00 or so, so we are improving slowly but surely. He’s also been sleeping in his crib fulltime at night which is also pretty awesome because it’s far, far away, upstairs so letting him cry it out (within reason) is easier. Rex excels in a few disgusting skills: drooling (National Champion level), spitting up (World Champion level), and blow-outs (Universe Champion level). No joke, the kid changes clothes on average probably about half a dozen times a day, half of which are from drool/ spit up and the remaining half from spewing nasty yellow-green baby poop all over himself (and usually his car seat too). As I mentioned earlier, he’s a great little rolling machine, and uses this skill to get around (on accident I think though). Additionally, Rex shines at smiling and laughing, and is a very jolly little baby boy still. I also really think he can smile with his eyes too – he has very “kind” eyes. Rex can also gnaw on his toes really well, and then easily transition into the Happy Baby yoga pose (see pics below), which suits his sweet little personality. He is starting to grab for toys and play with them by himself a little bit too which is exciting (self-entertainment is always a good thing!). And just like he did in the womb, he kicks his fat little legs almost nonstop when he’s awake! So, what does Baby Rex look like these days? Well, as I’ve hinted to earlier, he’s becoming a little porker; getting chunky in all the right places (cheeks, thighs, belly) and wearing it well! His hair seems to be a light reddish orange with some blond undertones. It is still really short, but I can tell it’s growing on top (he’s worn most of it off the back except for his little Hitler mustache (although not nearly as pronounced as hers, see Landri’s here from back in the day. M: What do you like the most about Rex? S: He’s my son! What? I like everything about him. Except for when he cries during the night. M: What about crying during the day? You’re okay with that? S: I hate all crying. M: What do you like the least? S: I just told you. M: So you’re cool with poopy blowouts? S: I don’t like them, but I prefer them over crying at 4 in the morning! S: He rolls. Really well. M: What do you wish Rex would improve or learn to do next? M: That’s a good one! M: What is the hardest part about having two kids under 2? S: That you can’t do anything. M: What is your favorite physical feature of Rex’s? M: That’s what I would have said too! Man, I’m impressed! You’ve been breaking all kinds of records with your word count here lately! Kudos, Daddy! Previous Post 23 months: Toddzilla Update, 1st Swear Word & More!